TimeWolf Juno Employee Time Clock System for 50 Employees (Upgradeable to 100 Employees). Includes the Juno Fingerprint Reader. Optional Modules include a Multi-User License, Employee Scheduling and Job Costing. The Time Wolf Fingerprint Employee Time Clock is an affordable time clock, bringing you the power of an automated Time Clock System at a very low price. The clock, compact in design and easy to use, allows the employee to clock In and Out by placing their Finger onto the reader pad or via entry of a PIN Number at the keypad. The employee has the ability of viewing their last recorded punch time, transferring departments or even entering other information like tips, etc. The large LCD Display provides maximum readability and the on-board speaker provides an audible confirmation of a complete or incomplete transaction. The data collected by the Fingerprint Time Clock Terminal is then sent to the TimeWolf Employee Time Clock Software. TimeWolf puts you in control, detailed reports can be generated, exceptions tracked and corrected and then data can be passed on to payroll for check processing. Optional: Internal Scheduler to activate and sound the internal speaker to signal commom start, end and break times. (No external bells or horns can be connected). Read on for screenshots of the TimeWolf Employee Time Clock Software and detailed information about each of the powerful standard features of the system...features simply not packaged with other entry-level time clock systems!! Several practical and powerful Optional Software Modules are offered, that yet again sets the TimeWolf System apart from the rest!! TimeWolf 50-Employee Time Clock Software (upgrades for employee capacity are available up to 100-Employees). **Need a system for more than 100-Employees?? Click Here for our InfiniTime System. TimeWolf Fingerprint Time Clock...a complete Employee Time Clock System Right Out of The Box. Employee HR Profile Management: Setting up employees in TimeWolf is as easy as 1-2-3. TimeWolf Employee Time Clock Software allows you to enter vital emlployee information such as job title, hire date, last review date, wage rate, last raise date, date of birth, special employee specific holidays and emergency contact info. Companies that calculate and track Off-Time Benefit Hours will appreciate the built-in automatic accruals capability of the software, allowing up to (2) two paycodes to be accrued. 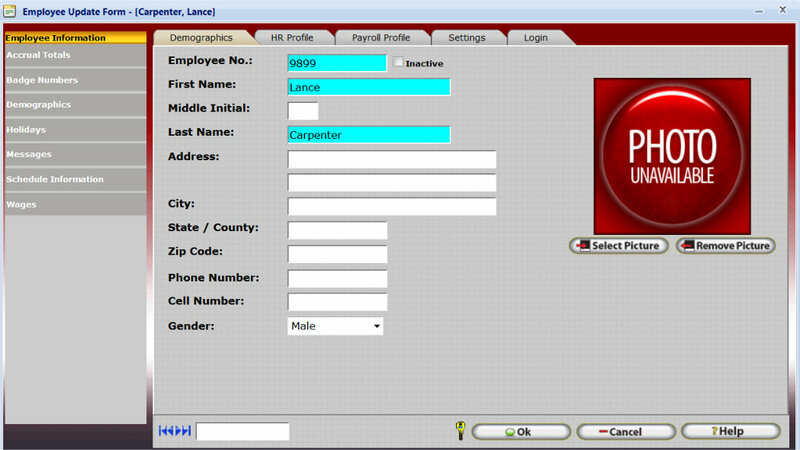 Employee pictures can also be stored and viewed from this screen. Optional Accruals Plus Module: Add the optional Accruals Plus Software Module to automatically calculate (3) three or more accrued pay codes and to process more complex accrual policies, such as to transfer or "Bank" an employees overtime hours into for instance a, PTO (Paid Time Off) pay code. Optional Employee Scheduling Module: Scheduling of Employees is not required in the TimeWolf Employee Time Clock Software. However, for companies that require it, Setting up Employee Work Schedules is easy as 1-2-3. 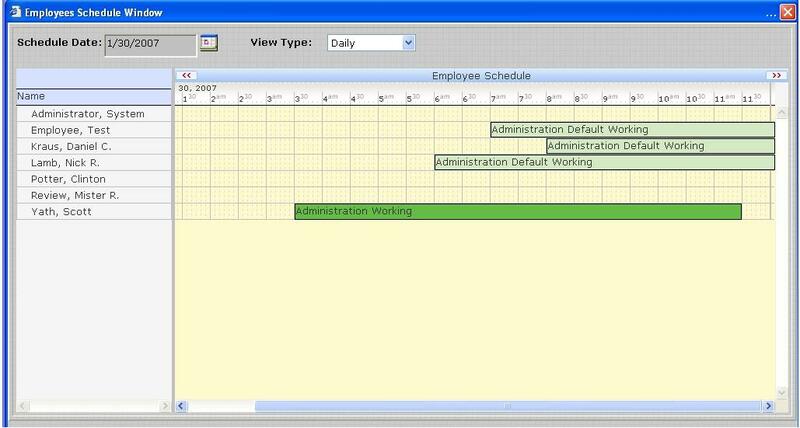 InfiniTime offers a robust Gantt Chart style schedule screen for dynamic scheduling. Easily arrange and filter how you view the schedules, by using Departments or Groups settings. Easily create and/or modify by using familiar Copy and Paste to schedule individually and/or use copy From-To, by Date Ranges, Department-to-Department, etc. Default Schedules based on Departments, Coverage Requirements or each Individual Employee can be used to further expedite the scheduling process. Scheduling can be used to simply print a Postable Schedule Report for posting in the lunch room for reference by employees or for more powerful reasons, such as management review of Schedule Hours versus Actual Hours worked to determine how well departmental and overall hours budgeting may have been met, etc. Schedule by Availability: The TimeWolf Time Clock software handles scheduling for workforces where the employee's schedule is created and chosen based on his or her "Availability" to work and/or when Task Certification Level is required for a particular job description. Next, Skeleton Templates can be created for each day so that the manager is ensured to provide enough schedule coverage during standard, high demand or seasonal scenarios. Shift Differential: Apply Differential Pay and hours calculations for the premium shifts or zones that your company requires. Punch Lockouts: Unlike other Time Clock software, TimeWolf's punch lockout capability is directly tied to the employee's schedule, thus allowing this feature to be more logical, dynamic and therefore, much easier to setup and implement. Apply punch lockouts for employee's In and Out punches right at the clock. Time Card Editor: Make quick work of employee mistakes...enter missed punches, edit/delete existing punches, enter Off-Time Hours such as vacation, and sick time...all with a comprehensive Audit Trail, where changes are tracked based on user ID. Punch Exceptions are Color Coded; easily spot Missing Punches (Red), Out of Schedule (Purple), etc. In addition, reference the employees assigned schedule for a day and easily edit/reassign the correct schedule without having to leave the Time Card Editor. Time Card Approvals: The TimeWolf EmployeeTime Clock Software can be configured to require the manager's approval of the hours for each employee...any unapproved hours will not be exported to payroll. An TimeWolf exclusive!!! Our Time Card Editor is not only the most powerful you will find compared to other entry-level time clock software, it can also be configured based on user preferences. Users can view or hide each column of data. Yet another unique and powerful feature that will dramatically increase productivity, is the ability to "Filter" and "Toggle" the Time Card Editor to view; view only employees with Missed Punches, or, only Employees with Late In Punches, etc. The TimeWolf Juno Employee Time Clock Systems is ready for a variety of Data Collection Options...choose one method or a combination of each...all are included on this system!! Employees will Punch In/Out from the TimeWolf Fingerprint Time Clock Terminal. The Punches are then polled by the Time Wolf Employee Time Clock Software. Employees can perform Department Transfers, View Last Punch, and View Accrual Totals all from the Juno Time Clock. Punch In from a Computer Keyboard, also referred to as PC Punch, is one of the methods for employees to perform In/Out Punch transactions using TimeWolf. Employees simply log-in via the Employee Self Service Module to punch. Employees can also view their Time Card Punches and total hours, view their assigned Work Schedules and Benefit Hours accrual balances for Vacation and Sick Time all from the Employee Self Service Module. The TimeWolf Employee Time Clock system is also offered with a PIN Entry /Proximity Badge Reader Time Clock...click for information on the TimeWolf Zephyr Badge Reader Time Clock System. Real Time Clock Polling!! The System Clocks Monitor runs as a true Windows Service on the computer and can be set to poll and update / program the time clocks in as little as 3 second intervals. The TimeWolf Employee Time Clock system is also offered with a Hand Recognition Biometric Time Clock...click for information on the TimeWolf Scout Hand Reader Time Clock System. Can unauthorized Managers or Employees access the TimeWolf software? No. First and foremost is the matter of security...be assured your data is protected. The TimeWolf software software is password protected preventing unauthorized login into the system. Will I have to manually Poll the time clock terminal? No. Real Time Polling!!! The System Clock Monitor runs as a true Windows Network Service...this facilitates fast and efficient polling cycles that can be set for as little a (3) Second Intervals. However, Manual Clock Polling can be performed if neccessary Note: If your system is using only the TimeWolf Software to punch via a computer workstation (no physical hardware clocks), then Punches post automatically. What about Disaster Recovery, Can Backups be created automatically? Yes The Time Wolf Employee Time Clock Software incudes a very easy to use Data Backup Tool. Simply configure it to create a copy of your time clock data files at scheduled intervals. This way your vital Payroll Data is protected in case your computer system becomes unstable or corrupt. The Time Wolf Employee Time Clock software will only run the following Windows operating systems. ALSO, Windows 2003 Server (Standard SP1 and R2), and Windows 2008 Server (Standard and Enterprise 32/64 Bit). ALSO, Windows Vista (Business and Ultimate) is supported, as well as all (32 / 64 Bit versions). Maximum employee count of 100-Employees (network multi-users or stand alone). 1) Server requires RAM= 2GB or greater and 6GB hard drive space. 2) Workstation PC's require Internet Explorer, FireFox, Safari, Google Chrome web browser. 3) Windows 2000 Pro and Windows XP Pro limits concurrent "connections" to a maximum of 10 (includes devices on the peer network; IP Addresses, Other Workstations, Time Clock Terminals with TCP/IP Communications, etc)...this is not a limit of TimeWolf, but a limit imposed by the afore mentioned Windows operating systems. Powerful Employee Time Clock Solutions for your Small Business!! Keeping track of employee punch times, scheduling, and payroll should be the easiest part of your job, but, unfortunately, it is a tedious task. That’s where the TimeWolf Juno Payroll Time Clock comes in! Avoid the anxiety that comes with counting employee hours and maintain each payroll. Timekeeping and tracking employee payrolls are easier than ever with this compact TimeWolf Juno payroll time clock. Don’t feel like dealing with digits and PIN codes? This payroll time clock is equipped with fingerprint-reading technology, making clocking in and out easier than ever. 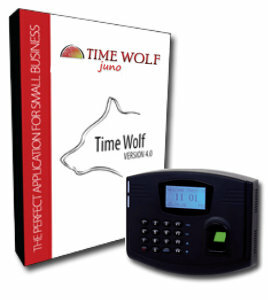 This TimeWolf Juno time clock comes with the ability of maintaining timing and payroll details on up to 50 employees. For those with larger offices, upgrading is possible, with the potential of keeping details on up to 100 employees. This TimeWolf also features a unique TimeWolf Employee Time Clock Software, which allows you to generate detailed time reports which can be sent to payroll for quick check processing.